Burnley goalkeeper Joe Hart celebrates after the final whistle during the Premier League match at the Cardiff City Stadium. PRESS ASSOCIATION Photo. Picture date: Sunday September 30, 2018. See PA story SOCCER Cardiff. Photo credit should read: Nick Potts/PA Wire. RESTRICTIONS: EDITORIAL USE ONLY No use with unauthorised audio, video, data, fixture lists, club/league logos or "live" services. Online in-match use limited to 120 images, no video emulation. No use in betting, games or single club/league/player publications. Sean Dyche believes that finding a permanent base to work from has helped goalkeeper Joe Hart hit the headlines for all the right reasons once again. The 31-year-old is slowly rediscovering the form that earned him a record four Golden Glove awards in five Premier League seasons with Manchester City. Hart has currently made the most saves of any goalkeeper in the top flight, leading West Ham United shot-stopper Lukasz Fabianski by one with 34. 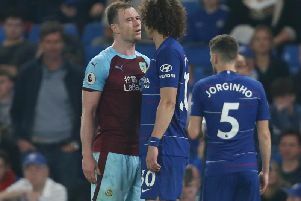 The two-time Premier League winner, who has kept four clean sheets across the board since moving to Turf Moor in the summer, has also made the joint second highest number of punches in the division, alongside Manchester United’s David De Gea. After another positive display against Cardiff City in a 2-1 win, the Burnley boss said: “There was a good save in the first half down to his left. “He would feel that was savable, I was more impressed in coming off his line to dominate the box. “I thought he did that a number of times and managed to get something on it even when it looked he might not, he still managed to get the ‘go-go-Gadget’ arm out and get a touch on it. “The goalkeepers we’ve got are all very, very good. They would expect to save them ones. I’m very demanding of them, unless it’s double world class they don’t get that much praise. Pep Guardiola’s arrival at the Etihad in 2016 prompted a change of circumstances for Hart and his performances in loan spells at Torino in Serie A, and then with West Ham United, came under scrutiny. Despite being England’s goalkeeper for three major tournaments, earning 75 caps in total for the Three Lions, Hart was then left out of Gareth Southgate’s 23-man squad for the 2018 FIFA World Cup in Russia, representing his country for the last time in a goalless friendly with Brazil. However, recent performances may have put him back in contention for a recall with UEFA Nations League games against Croatia and Spain coming up. “I don’t think he’s been under the radar, I’ve been asked about him a lot,” said Dyche. “When I spoke to him about coming in I said he’d be free to play. He had a start due to injuries that we had but there’s a big demand here, there’s a group of goalkeepers who are demanding and he’s risen to that. “I think he maybe needed a base again. Going on loan is a different thing, it can work magnificently or be a real challenge. “I can assure you one thing, he didn’t come for the money. He wanted to play, to test himself with a different kind of group.